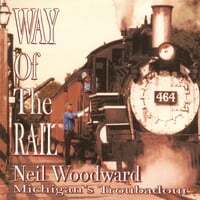 With deep roots in American folk and old time country blues musical tradtions, Neil Woodward, Michigan's Troubadour employs his rich baritone voice and a boxcar load of string and wind instruments to tell his stories new and old. America's history is full of stories about trains. The songs on this CD tell the tales of rail lines and locomotives, engineers and firemen, brakemen and hoboes, heros and bandits, frolics and flings, with time spent in church and at the old fishin' hole. Neil Woodward brings a lot of love and a boxcar load of traditional acoustic instruments to accompany his warm baritone voice. The list of songs includes classics of American folk and country music. The final track features a brand new Edison wax cylinder recording of The Big Rock Candy Mountain, performed by Neil with his fiddle (just like Fiddlin' John Carson) and cut on a 100+ year old recording machine. Original compositions are Engine 464 and Crossroads Serenade. Neil Woodward is Michigan’s Troubadour. For over thirty years he has shared folk music’s warmth and wisdom with Great Lakes audiences. In such historic surroundings as Crossroads Village and Huckleberry Railroad, Henry Ford Museum and Greenfield Village, and in schools and libraries lake-to-lake, his vast repertoire, musical skills and enthusiasm bring to life the Michigan experience for people from around the world. In 2003 the Legislature of the State of Michigan officially named Neil Woodward Michigan’s Troubadour in recognition of his life long commitment to preservation of Great Lakes folk music and culture. The Arts Foundation of Michigan (now ArtServe Michigan) with their Creative Artist Grant Award recognized Neil’s own compositions as continuing contributions to the troubadour’s tradition, an artistic chronicle of significant individuals and events. His songs, recordings and concerts have earned him nine Detroit Music Awards. His traditional recordings are catalogued by the Library of Congress Office of Folklife, and by the Library and the Archives of the State of Michigan. Neil Woodward performed at Ford’s Theatre in Washington, D.C. and participated in the Original Cast Recording as an original cast member/multi-instrumentalist and Musical Director for the musical play Woody Guthrie’s American Song. Neil served as Research Assistant to Jeff Place, Smithsonian Folkways Archivist during the play’s extended run in Washington. Since its debut runs in New York and Detroit the play has run in cities all over North America and also Vienna, Austria. Neil’s experience in performance, research, writing, arranging, theatre, audio and video production, and his widely acknowledged skill with over a dozen musical instruments offer a unique perspective to his many private students. His school programs bring our culture into focus for pre-school through college level. In venues as diverse as the Rock and Roll Hall of Fame, Michigan Historical Center, Detroit Institute of Arts, Northern Michigan campgrounds and lighthouses, and community schools of Davison, Detroit, Kentwood and Alpena, Neil’s performances pay tribute to light keepers, migrant workers, sailors, soldiers, teachers, mothers, fathers, lumberjacks, railroaders, farmers, hobos and auto workers.